Lymphedema is characterized by an excessive accumulation of protein-rich fluid in the superficial tissues, leading to swelling in the affected body part. It can have significant consequences for the patient if left untreated. Our certified therapists work with patients according to specific limitations and desired outcomes. The treatment consists of daily visits until initial symptom control is achieved. At each visit, the patient will receive one hour of individual attention from a certified lymphedema therapist. There are three basic stages of active Lymphedema. The earlier lymphedema is recognized and diagnosed, the easier it is to successful treat it. Complete Decongestive Therapy (CDT) – This is a manual treatment which helps to increase the activity of certain lymph vessels and manually moves interstitial fluid. Our certified therapists will work with patients to decrease the volume of the affected extremity to a normal or near normal size. Patients can expect a very light touch applied to the skin’s surface over the areas with lymph nodes on the body. Manual Lymphatic Drainage (MLD) – is used primarily in the treatment of lymphedema and venous insufficiency edema. It is a combination of MLD, bandaging, exercises, and skin care. This treatment may also involve breathing exercises, compressive garments, and dietary measures. Compression Bandaging – Lymphedema banding is one of the most powerful components in the treatment process. While the extremity is reducing in size, the bandage is adapting to the new dimensions. Compression bandaging increases the effectiveness of the muscle pump mechanism. 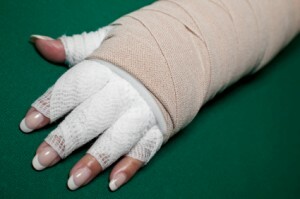 Therapeutic Exercises- Excercise are performed with compression bandaging. Exercise mobilizes the joints and strengthens the muscles of the involved limb/limbs/trunk quadrant, thus decreasing the risk of strain. Our goal is to see lymphedema patients within 24 hours so we can start lymphedema therapy and help reduce the effects of this condition. Please call us at 615-624-8476 for further information.